Today we kick off a series of Q&As with our Don Quixote cast members by chatting with Argentinean bass-baritone Eduardo Chama, who is our opening night Sancho Panza. While Don Quixote is making its Seattle Opera premiere, Chama has performed the role of Sancho several times before—so we ask him about his deep respect for the character, and we also talk about his background with the classic Cervantes novel, and what it's like to be a teacher when he's not performing. Many Spanish-speakers say they grew up with the story of Don Quixote, and that it was an important part of their culture—even if they aren’t from Spain. As an Argentinean, was the story familiar to you as a child? Yes, that’s correct. All Latin American countries treat Don Quixote as English-speaking countries will treat Shakespeare. Cervantes was a genius of the same level. Don Quixote is a huge book for a kid to read, however there are plenty of versions for kids—even comics about it, and cartoons that we grew up with. But for me, the serious reading started in high school, where we not only read it but we analyzed it, grammatically and artistically. Don Quixote was, in a way, the beginning of the modern Spanish language. But what I think is even more important is the story’s message of the old values that were lost, and this old dreamer full of humanity that restored them in his heroic fantasy quest. I hope we soon have more Dons around (Quixotes, I mean, not Giovannis—those we have plenty of!). 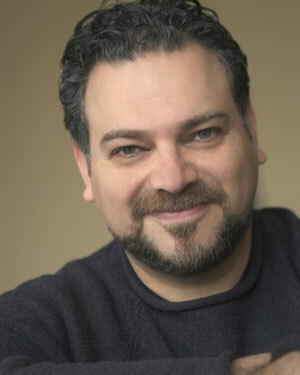 Eduardo Chama as Leporello in Seattle Opera's 2007 production of Don Giovanni. Pictured on the left is Mariusz Kwiecien as Don Giovanni. You seem to enjoy the role of Sancho Panza, as you’ve done it several times. What draws you toward the character and to this opera? What I like about Sancho is that he values Don Quixote for what he is: humanity and tenderness walking amongst people who cannot see that life without values, romance, art, chivalry, and poetry is not life. Sancho is not with Quixote for the money, neither for the food—remember, Quixote used all his money on books, so perhaps a very slim horse and donkey is all they have. Yes, Sancho is constantly trying to bring Quixote back to earth—almost like a cable a tierra, you know that green cable that goes into the ground so things do not blow out? Sancho is the protector, and he sees reality as it is, but he also sees Quixote’s world and he so much wants to believe in a better place. I do not even think that Quixote’s death will stop Sancho from believing in a better place. I truly believe Sancho will continue Quixote’s quest to his own death. He still enjoys the earthly things, of course, like food and wine. “Belly” is his last name! I think this is what attracts Quixote to him, because Sancho brings a balance to Quixote. Quixote feels at home with him and you hear this constantly. The language they both use to communicate is a huge cue of what their relationship represents to each other. The role also has lots of humor, but not buffoonery. And perhaps what I enjoy most about this role is that Sancho Panza transforms into a wonderful human being. This materialistic Sancho with very few values becomes the best student of humanity and tenderness—a true student of the Quixote life. Musically, Sancho starts with a very light way of singing (short phrasing, with a sense of humor—almost exactly the opposite of Don Quixote). However, during the quest, he becomes as elegant and heroic as his master. The aria at the end of Act 4, where he defends his master against a group of Dulcinea’s friends, is one of the most beautiful arias for the bass-baritone repertoire. You see his transformation, you hear it, you taste it, and I hope at the end of this opera that perhaps some of the audience will transform a bit, as well. 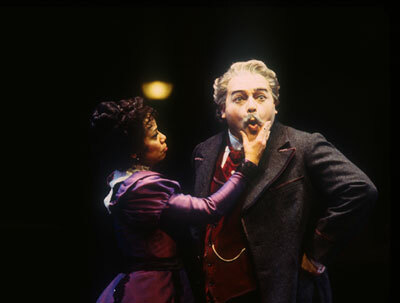 Eduardo Chama as Don Pasquale in Seattle Opera's 2003 production of Don Pasquale. Also pictured is Harolyn Blackwell as Norina. What do you think about Sancho’s relationship with women? He claims to hate them in Act 2, but do you think he really means that? Nooo, he doesn’t hate them, but he surely doesn’t understand them, either. I think what he says is more in reference to his master’s relationship with Dulcinea. He knows Dulcinea is bad news for Quixote and, in fact, Sancho is right. The love for Dulcinea and the fact that she can’t be with Quixote is what ends up killing the Don. Yes, Sancho is married, and he says in the opera that he goes through all this trouble with Quixote because these adventures take him away from his wife, and that is why he is happy. But as I said before, Sancho is the protector and takes charge. In a very exaggerated speech, he says anything to convince Quixote to stay away from Dulcinea, even saying he “hates” ladies. Remember, Sancho is Mr. Earthly Things. Wine, food, and ladies are on that list—and not necessarily in that order. Last season, you portrayed a very Italian Falstaff. Now you’re doing a French opera. How are the Italian and French styles different for you as a performer? French style and Italian style are very different, however both of these operas have something in common, and that’s how wonderfully they are written for the voice. In both operas, the voice is treated with extreme attention, and there are beautiful lines of singing in service of a wonderful and dramatic story. The French and Italian languages are very different, [but in both you need to be concerned with] the stretching of the phrasing and where the accents lead you, in order for the language to be understandable without sacrificing the sound, the singing. 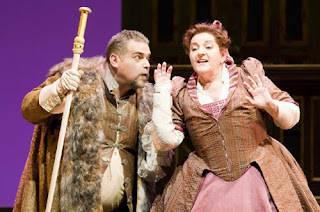 It’s interesting that both operas came from works originally written in a different language (Falstaff in English, Don Quixote in Spanish) and both were modified, re-written, and adapted for opera—which is a tremendous quest in itself! But coming back to your questions, yes, different styles but both with beautiful singing and acting. Eduardo Chama as Falstaff in Seattle Opera's 2010 production of Falstaff. Also pictured is Sally Wolf as Alice Ford. I’ve heard that you’re also a teacher. Have you done any teaching lately? What are some of the most important characteristics of being a good voice teacher? Yes, since 2006 I’ve been an Assistant Professor of Voice at Rutgers University in New Jersey. I am teaching constantly, and before joining the Rutgers family I always kept a studio in my home. Singing and teaching are my two equal loves. I have 18 students at Rutgers alone, and yes, I am teaching constantly—even as we speak, I need to send e-mails to make sure the students are taken care of when I’m not around. At the beginning of my career, I was helped by many people that believed in my talent, and that found excused to teach me even if I didn’t have the money to pay for lessons. I discovered then that passing the torch of knowledge was not only a way to do good, but also a way to keep myself young and understand the vocal needs of the 21st century. It’s hard for me to say what makes a good voice teacher, since I sometimes feel I am still a student in more ways than a teacher. However, I can tell you certain characteristics I believe a good voice teacher must have: a good ear, knowledge of the human voice and behavior, lots of mind reading abilities, and a huge heart for what he or she does. Es bueno ver que hay argentinos regalando arte por el mundo. No se si alguna vez podré ir a USA (es medio complicado el tema), pero al menos, como amante de la ópera, se que en Seattle hay un argentino largando notas al aire. Saludos desde Mendoza (aunque soy oriundo de Bs. As. ).